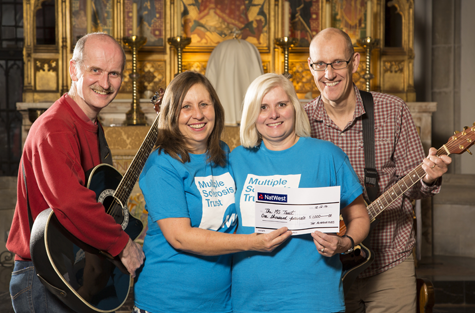 Arundel rock band The Alternatives and Burpham Village Committee have donated £1,000 to the Multiple Sclerosis Trust. The cheque was collected by MS nurses Lisa Black from Worthing and Katrina Orchard from Chichester on behalf of the MS Trust. Half the money was raised at a Summer Party, which was held in a giant barn at Home Farm in Wepham. The Alternatives provided the entertainment and the Burpham committee did the rest, drumming up great support for the event. When thanking the band for their performance, the committee's treasurer Valerie Belton commented that "the music was terrific, and very easy on the ear". There is talk of repeating the event next summer! The Alternatives are a six-piece rock band comprised of members and friends of the St Nicholas Church congregation. They were formed in 2005 and have raised thousands of pounds for local charities and St Nicholas Church Arundel through their performances.